The ritual: grinding beans for a fresh pot of coffee, and while the brew is percolating in the background, flip through the sketchbook to see what’s what. Incubating in the mulch-pile of doodles might be a picture without a caption, or an idea without a drawing, or some potential material that just needs a bit more tweaking. Very rarely does anything spring forth unedited, and like most of my stuff, reworking it is just an accepted part of the process that usually makes for a better drawing. The balance is in knowing when it’s good enough to get the job done and time to move on to another one. 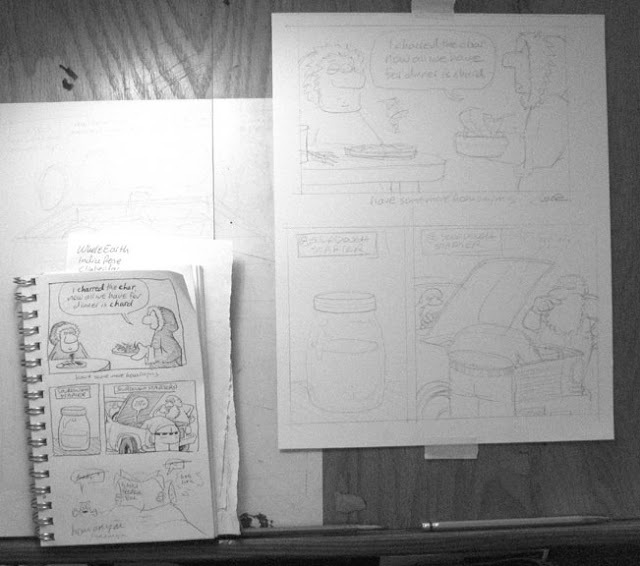 There’s always plenty of opportunity to refine the work during transitional phases of a scribble on a scrap of paper, the translation into the sketchbook repository, and the penciling to Bristol board + final inking stages, not to mention additional steps on the computer (which I'll try to cover some in tomorrow's post). I try to have a stash of anywhere from one to three months of cartoons done way ahead of time, but still devote time each and every day to doodling, or at least write down some ideas, plus dedicate a block of time each week (couple/few days at least) to be actually at the drawing board, and especially, one weekend a month in intense overdrive when meeting multiple deadlines. This generates a steady backlog should I need to quickly draw material from the compost heap, ith the added benefit that there’s no shortage, no stress, and never any blockage. Really my problem is suffering from creative diarrhea sometimes; as opposed to the artist who is stuck for ideas, I usually have too many that are mediocre and not enough good ones. A little checklist is made out of the top selections after the sketchbook review for a new, fresh, steaming batch of (six) Nuggets and (three) editorials. Many times after the passion fades, or I wake up and look at the last night’s efforts, I wonder just what in hell I thought was so funny to begin with a particular idea, though most the time I don’t waste energy second-guessing them or being overly-critical. There’s always bound to be a bit of overflow or extra material done to pad the “Unused” folder on the desktop, and I’ll often voluntarily either edit or reject my own stuff after a bit of time has gone by and I’m a bit more objective – or at least until something better comes along. Lost count of how many times I’ve drawn what had to be the funniest damn cartoon ever done, only to wake up the next day and watch it fizzle out before my bleary eyes. Or sometimes nobody else seems to get it during the test-market phase, which is where I’ll print off a set and bounce them off random people at cafes and bars. Sometimes I can take a subtle hint and gracefully retire the panel before it ever hits the newspaper, other times I simple couldn’t care less what other people think and run it anyways. A related side-note in that recently I finally succumbed to the latest middle-age fad where they seem to be re-releasing every horrible TV series in boxed DVD sets in an embarrassing appeal to nostalgia. Well, I broke down and bought the first season of the Muppet Show, and have ever since been wallowing in a flashback of inspiration; heretofore I had only attributed visual artists like Don Martin (Mad Magazine) and B. Kliban as pivotal influences, but truth be told I probably owe just as much to the genius of Jim Henson when all is said & done. Even the own characters have long tended to reflect a vaguely androgynous muppet-like aesthetic, to say nothing of how much the absolutely horrible and stupid gags of Fozzie Bear will still put me in tears – that was the connection where all of a sudden everything came full-circle. Not sure what that says about my tastes if as an artist I don’t cite some vaunted classic enshrined in the Metropolitan or Louvre, but point at the TV instead, but oh well, for what it’s worth, there it is. Now anyways, back on topic; while there’s a lot to be said for maintaining the purity or integrity of your original vision, there’s almost as much to be said for failing to communicate your ideas and failing because the ideas too obscure, or not funny, or the drawing doesn’t express the content adequately. I’ve been occupying this sub-regional niche long enough now (over two decades in the Fairbanks Daily News-Miner) to have a working understanding what generally works and what doesn’t, but experience aside, I’ll still struggle to find that balance between being creative, original and unique along with the task of being funny and having people “get it”. It’s been mighty humbling to realize in retrospect how much you personally have flopped, along with the comparatively fewer home-runs, of which there’s fortunately enough to convince myself to keep plugging along. And as per the Fozzie Bear epiphany, learning to be comfortable admitting sometimes I really don’t have high standards (if any at all), and take great pride in producing some of the flat-out dumbest gags possible. At least it's nowhere near as rough as when a stand-up comic bombs; as a sit-down comedian I'm spared the face-to-face reaction. 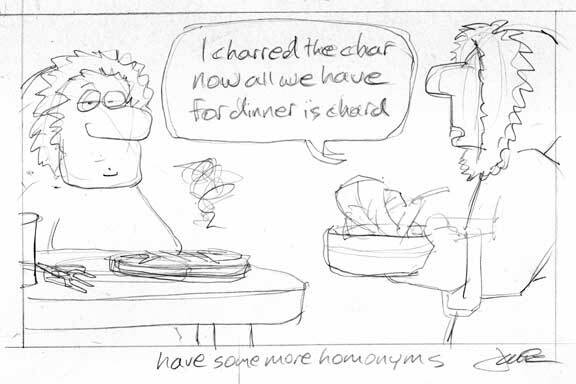 The content of my cartoon feature will usually be in the theme of local-yokel gag material, even that sometimes "you have to live here to get it" caliber. Which is actually a perverse point of pride now, even if it limits the scope of appreciation of the feature and effectively dooms my circulation and appeal to a limited audience. That’s totally fine with me, as I more often than not tend to think that catering to the lowest common denominator in society will yield some pretty bland results. And then there’s the factor of newspapers slowly going extinct, losing readership in no small part because increasing amounts of their content can easily be found on line for free, plus continually shooting themselves in the foot by cost-cutting topical coverage of local interests out of existence, publishing material that the community has no invested connection with. 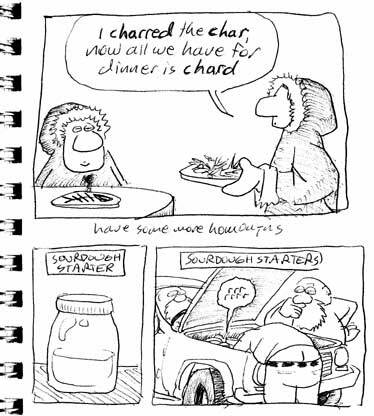 An oft-cited rule of thumb in cartooning is that a good joke will sell a bad drawing, and this is certainly evidenced at all the relatively poor draftsmanship in many of the syndicated funnies. That could also be carried out into the Fine Arts as well; postmodernism’s hallmark rejection of craftsmanship (in many cases), or even to some degree in contemporary illustration where style and content trumps talent. I’ve long maintained that it’s like one of those old manual equalizers for home stereos; the relationship and dynamics between a well-drawn-but-not-funny cartoon vs a funny-cartoon-that-isn’t-drawn-very-well vs the best-case scenario where it is simultaneously both a well executed drawing and well written joke. Many cartoonists maintain a one is first and foremost a writer in comics, which I understand but don’t fully agree with (more of the philosophical, masturbatory mind/consciousness schism). The best way I can describe it is synergistic effect: when the combination of elements results in something greater than the sum of the parts. Meanwhile, back to the old drawing board again; first there’s a warm-up, on either pet projects, random illustrations or maybe a couple panels that’ll never see the light of day as they’re too vulgar or crude (more and more of that weird stuff seems to squeeze out on the sides the tighter I grip). Things get going with rough sketches on a sheet of Bristol board, usually 2-up per page, with sketchbook at elbow for reference. 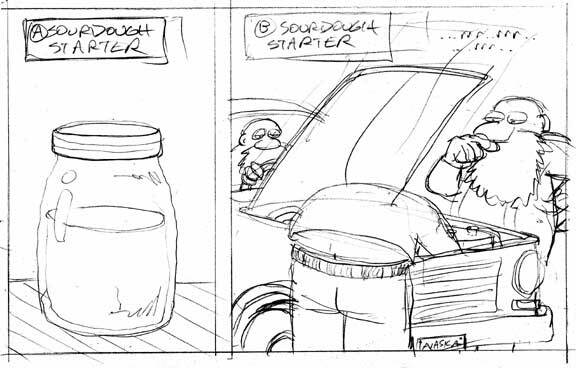 Many cartoonists and comic artists develop elaborate procedures using tracing paper, Xeroxed enlargements/reductions and light tables to preserve the qualities of spontaneity and freshness inherent in their original sketches. Not me, though I am at times secretly envious of works by creators who skip everything and can just go right to finished drawing. 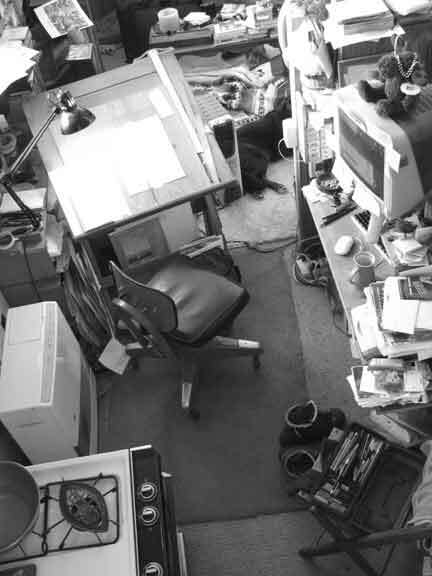 Probably a next phase for me when I get tired of all this and “retire”; confronting the fear of a blank page without the crutch of a pencil or even a preconceived idea (hints of that terror come up in the earlier blog post about jams). Tools of the trade: basic yellow pencil or an HB lead (I personally loath the mechanical pencils except in the case of extreme details and tight lettering), three different dip-pens for inking (from the smallest, a crow-quill, to a classic medium-sized Hunt 102 nib and an extra-large antique for extra-bold lines), sometimes brushes (Winsor-Newton Series-7 or Raphael Kolinsky #3 + crappy old beat-up one for spruce trees, white-out snowflakes, and large areas of fill), Microns (01, 03, 05, 08) – usually primarily for lettering, balloons and borders, a Magic Rub (or Pink Pearl) eraser, and a hairdryer to speed up the drying time. Erasing and retouching-up panels are petty much my favorite intimate moments to spend with the art before it becomes more of a detached, mechanical process after scanning. Revisiting them still later with wash, in order to have the original works to sell, is a full-circle counterpoint in creating cartoons, and quite often I find myself preferring the ink version to the published one. And then there’s even the curious observer who like to see the developmental stages done with ballpoint pen (which, by the way, I prefer to use the free ones available at Gold Hill Liquor & Grocery). 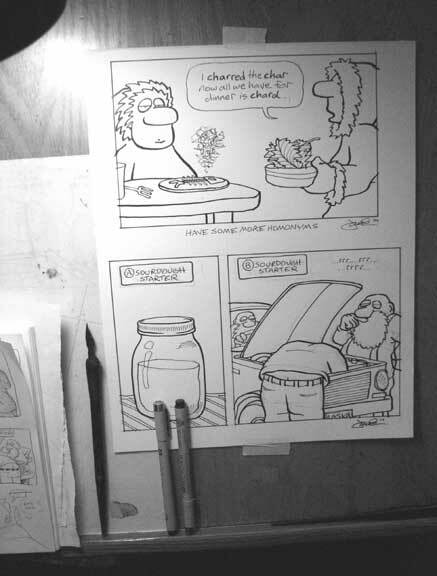 Shown here are the progressive stages from original doodle in sketchbook, scans of penciled version, and the final inked panels of two sample cartoons. One of the reasons I like drawing is simply that I love the act; the feel, the sight, sound and smell of drawing especially with a dip-pen and India ink (usually either Higgins Black Magic, Speedball Super Black). The line quality is always just slightly surprising in that it is a constantly evolving and living thing that is under your control but can still result in unexpected effects. Adding to this tactile wonder unfolding from one’s fingertips and hands directly onto the page there is the amazing act of creation in each little panel, something that never before existed and is a product of your mind and your ability to render them into reality.